The other Oliver + S pattern that stops at size 8 that I didn't think would be high on my to-sew list was the Sandbox pants. But these shorts? She adores them. She saw an old photo of a Sunday Brunch Skirt in this same bubble gum pink fabric and said she'd like that, only shorts this time. Well I happened to have more of the same pink drill that had been gifted to me and was leftover in the stash,. Easy way to revisit another soon to be outgrown pattern. I've made a straight size 8 and the few modifications are thus: Shortened to shorts length, curved the front pocket pattern pieces and added waistband elastic as well as the adjustable drawstring. The drawstring is just a supermarket shoelace but looks kind of cool even when it's not entirely necessary. 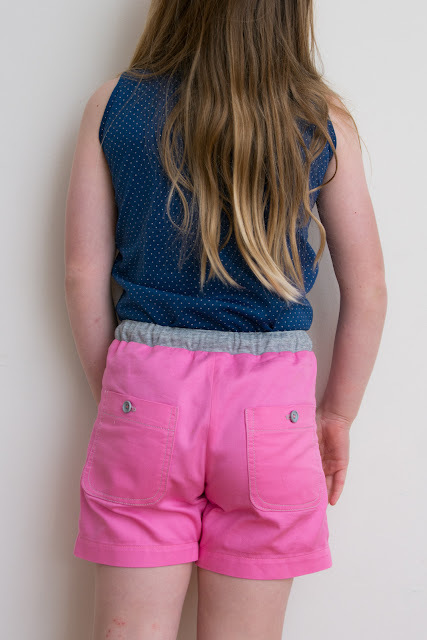 The idea of having the pants only held up by a tied drawstring is a bit optimistic when it comes to kids pants, hence the elastic added to the ribbing waistband. They're kind of perfect shorts and I'm glad I gave the pattern another outing. I know these will get heaps of wear and hopefully might still fit next summer. Sometimes the best clothes and the best sewing experience are those that are quick, simple and thrown together from the stash and an old pattern. Very satisfying. Super cute shorts!! Thanks for the tutorial too. I wonder if it'll work with the After School Pants pattern too? Absolutely! The After School pants would make great shorts and with the option to colour block that side panel. Go for it! Now that's a pattern I haven't thought about for a long time! These shorts are perfect! Very early 80s preppy. Love it! Oh heavens, she has not taken them off in the last few weeks. I'm so sick of that bubble gum pink, but so happy she's consistently wearing mum-made. THe mixed emotions are killing me! Very cute shorts and great tutorial. Thanks Sharon. Sometimes it's so obvious how to adapt a pattern you already have it, that it's easy to not see it. These make great shorts.